I finally finished my customer’s 112” x 112” Double Irish Chain quilt! 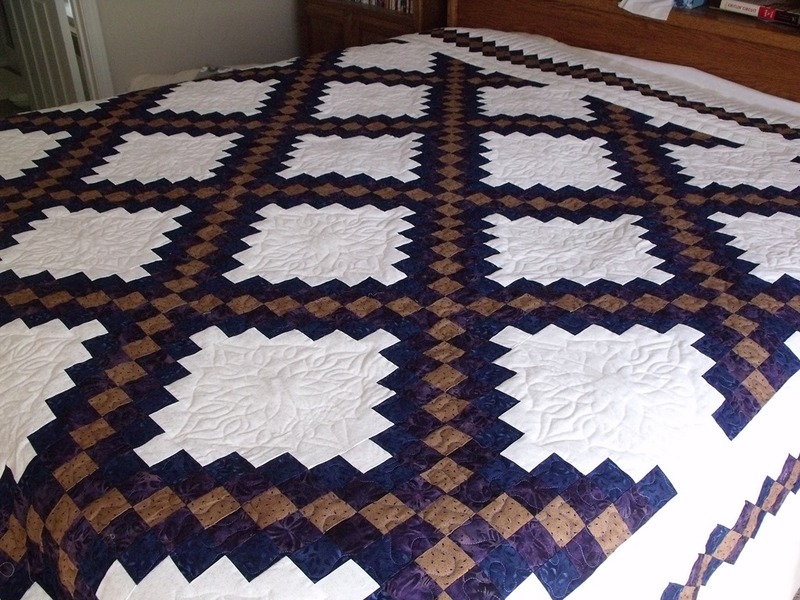 She provided a Hobb’s washable wool batting and I quilted an overall meander in the chains, a freehand boxy leaf pattern in the inner white border and a piano key on the outer border. I used a continuous line stencil pattern for the design in each of the setting blocks, tracing it from a printout of the stencil using the laser light on the back of the machine. It turned out great, and my customer really likes it! Two weekends ago I spent a full day with tech support again and we adjusted the electronics on my machine. It seems to be sewing a lot better, but I’m taking it slow because I don’t want to create yet another problem with the customer quilt I have on the frame. Once I get the off of there, I can put on a test piece and quilt the way I usually do. If it works, I’ll be back in business. If it doesn’t, then ABM is going to see if they can route a technician through Boise to get this resolved once and for all. This past week my mom came to visit because we got tickets to go to the Gordon Lightfoot concert! We had a great time and even though I couldn’t take any time off work I was able to work from home. That was awesome! The Boise Basin Quilters quilt show was this weekend, too. Mom isn’t a quilter and wouldn’t have had as much fun as I do when I go, so instead we went to the Farmer’s Market before her flight back home. After I dropped her off I went to the trunk show lecture that our featured artist, Marsha McCloskey, gave. It was raining on Sunday and with all of the activity of the busy week, I didn’t want to go out, even to the quilt show! I went, though, because I’d ordered some batting from the Winline Textiles vendor. I knew I’d enjoy myself after I got there, and I did. It was a really good show and I got lots of photos so I could refer to the quilting later for some ideas. I even got to talk to my friend, Julie, afterwards. All in all, I enjoyed the day but I got absolutely nothing done this weekend. I’ve come down with a sore throat, which started yesterday, so I’m working from home today with a colleague and trying to rest a bit, too. 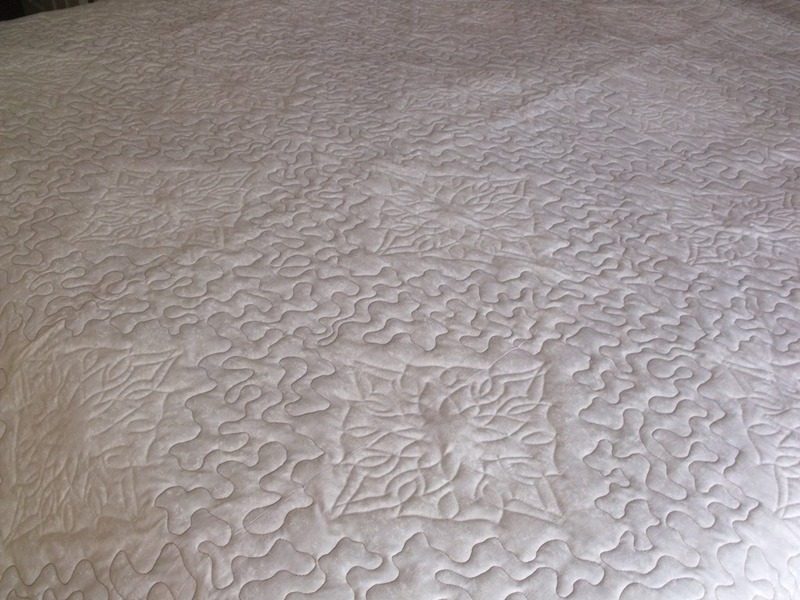 This entry was posted in ABM Innova, Boise Basin Quilters, Quilting and tagged ABM Innova, Boise Basin Quilters, Quilting.